The Safari room is the one place you can relax and absorb the areas covered in class . We believe in order to be attentive and to comprehend, you need to be comfortable and relaxed. This classroom is well suited for the many courses taught. We use modern technology – video, whiteboards, projectors and complete with handouts on the current topic. In addition, it is a relaxed, yet adventure themed atmosphere. Besides the standard seating found in most classroom environments, we have many unique areas for you to sit and relax – including a barber chair that Elvis sat in while having a trim! We are ready to go rain or shine …. The Outdoor Cafe doubles as a classroom. Many of our food classes are taught right here – from canning to wild edibles preparation. We get great reviews on this fully screened room. It has full video capability . A classroom that you will really ” enjoy” …. Juniper Springs Run is perhaps my favorite class room of all time. There is nothing like feeling the morning air and tasting the sunlight as it bounces off your face while you dart in and out of the shadows. This river may look peaceful and serene, but it has tossed more kayakers and canoeist than any other river in the area . For these reasons, and a million more, this makes for the perfect place to work on water skills, as well as animal and plant identification. 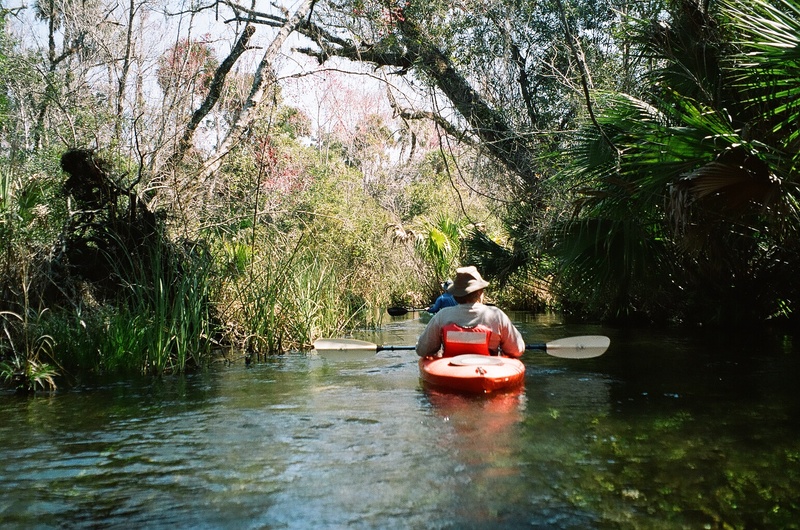 The water is crystal clear, flowing east – north east to the Great St. Johns River. 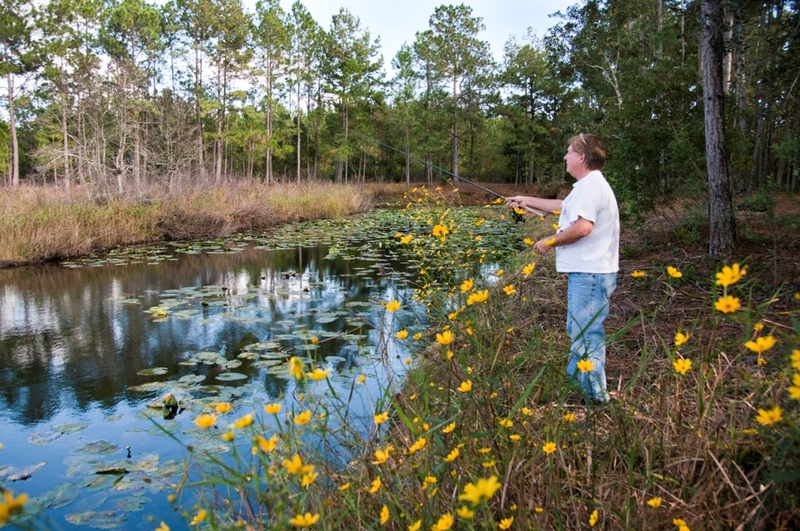 The Out Back Pond is truly a gift for our many students – it is full of fresh water fish, cattails and water lilies. We practice “catch and release”, but what a way to approach any wilderness situation; a para-cord stringer full of fresh brim or bass ready to fry on a hot rock, or filleted and wrapped in one of the many water lilies then roasted on an open pit. True, I am using a pole, but we do teach many other ways to snag a few for each meal. I know of no other class that has the top south eastern bass pro on staff to guide you with tips and tricks on where to toss that first cast! Here is a debris shelter made out of gathered material and a sheet of plastic – a great way to conserve body heat without expending a lot of energy. This shelter ranks fourth on our preferred methods of protecting yourself from the elements. Patricica one of our talented instructors is showing how comfortable and secure it is in anytype of weather .. You will learn to use our CAMP method when setting up any place to stay – Clean, Animals, Manageable and Protected.